Backblaze Review 2017 | Is this Online Backup Worth the Money? Backblaze is the simplest, quickest way to backup a single device at a rock-bottom price. Backblaze wants to win over customers through affordability and simplicity. 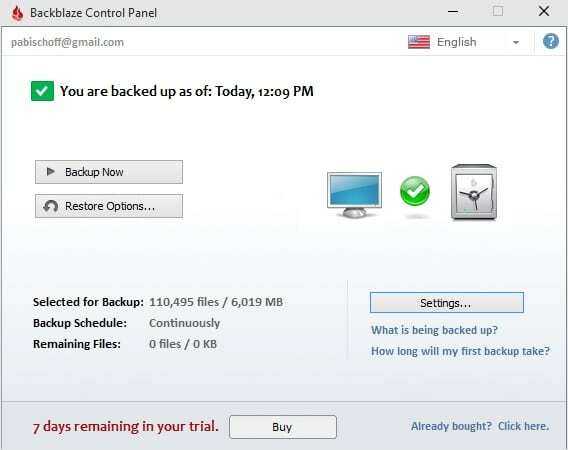 Targeting entry-level personal and business users who need a no-frills online backup solution, Backblaze undercuts most of its competition with a solid product and enticing “unlimited storage” offer. Backblaze doesn’t fuss around with different tiers and add-ons. The personal version costs just $5 per month, $50 per year, or $95 for two years. The business version runs $50 per year per computer. Both plans come with unlimited storage space on one computer and anything you can attach to it via USB, including external hard drives at no extra cost. Backblaze offers a 15-day free trial, no credit card required. Restoring a backup from the cloud is included in the price, or you can have a physical backup shipped directly to your door on either a 128GB flash drive ($99) or 4TB hard drive ($189). Backblaze boasts continuous backup, so by default there’s no need to schedule upload times, but you can also set it to back up daily or on demand. 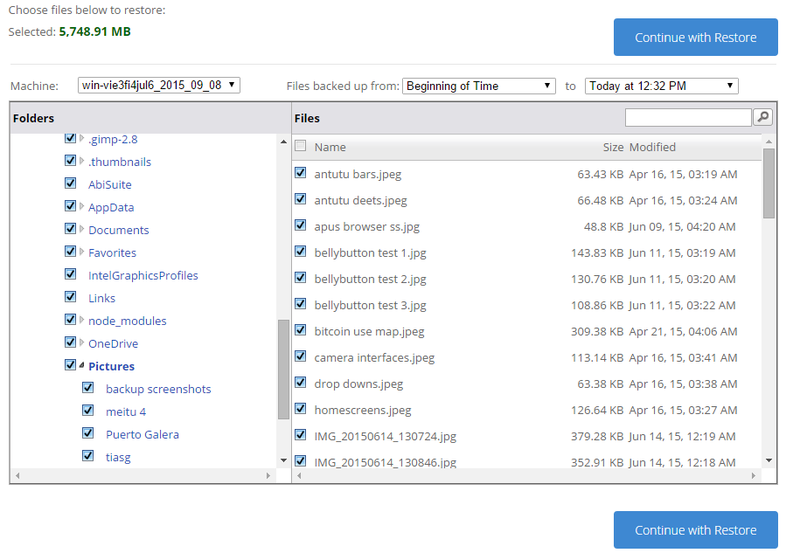 Set on continuous, Backblaze will update the cloud backup as you create, edit, move, and delete files. The desktop app can automatically throttle upload speeds according to your internet bandwidth, or you can adjust this setting manually. Business users get a web-based admin dashboard from which they can track billing, back up reports, licensing, and setup. Unfortunately, there’s no service for server backups. Any file in the backup that’s deleted can be recovered up to 30 days later. Backblaze users can also take advantage of its lost or stolen computer location service. If a computer goes missing, just log into the web app and select the option to locate the computer, and Backblaze will reveal its last known location. Unlike most other cloud backup services, Backblaze doesn’t let you choose which files you want backed up. It grabs everything in the computer’s user files by default, and you have to tell it which files and folders not to upload. This is handy if you don’t want to fuss with deciding which files to upload, and because Backblaze is unlimited it doesn’t really matter. But it can be bandwidth- and time-consuming if you just want a few select folders backed up. You can block specific files or filter by file size and type. Backblaze makes the whole process fast and simple, but it lacks several features flaunted by competitors. File syncing across multiple devices, sharing files privately or via public link, and email dropping are all noticeably missing from its repertoire. Backblaze excels at security but still wants to make it approachable for layman users. All user data is encrypted before it leaves a client computer, then is protected during transfer by SSL. Once it lands on Backblaze’s servers, it’s encrypted using 128-bit AES, which the company calls “military grade” but is actually bested by 256-bit encryption offered by a few rivals. Backblaze recommends most users stick with the default option of letting Backblaze store the key that unlocks the encryption. However, it does have an option to use a private key for those concerned about privacy. Keep in mind that losing the private key means losing access to your backup, and Backblaze isn’t responsible if private keys are stolen. Private keys should ensure that their owners are the only ones capable of decrypting their data. However, Backblaze goes about the private key option a bit strangely. Backblaze says the private key is passed to the company, and the data is encrypted on Backblaze’s servers rather than on the client’s PC. That sort of defeats the purpose of using a private key, as Backblaze still gets access to your decrypted data. Users can change their passphrase without re-encrypting their data, but must still know the original passphrase associated with the private key. Backblaze owns its own servers in the USA, rather than renting out virtual space from third-party providers like Amazon and Rackspace. Those datacenters are protected 24 hours per day by security staff. The facilities utilize biometric security and redundant power supply. Desktop clients are available for Mac and Windows. They couldn’t be much simpler. A single pane with three buttons for Backup Now, Restore Options, and Settings. The first is self explanatory, the second opens a window asking if you want to backup from the cloud or ship a physical device, and the third presents a few tweaks like file exclusions, scheduling, and notifications. The web app is similarly minimal. It’s basically just a file browser with the option to restore files to the PC. 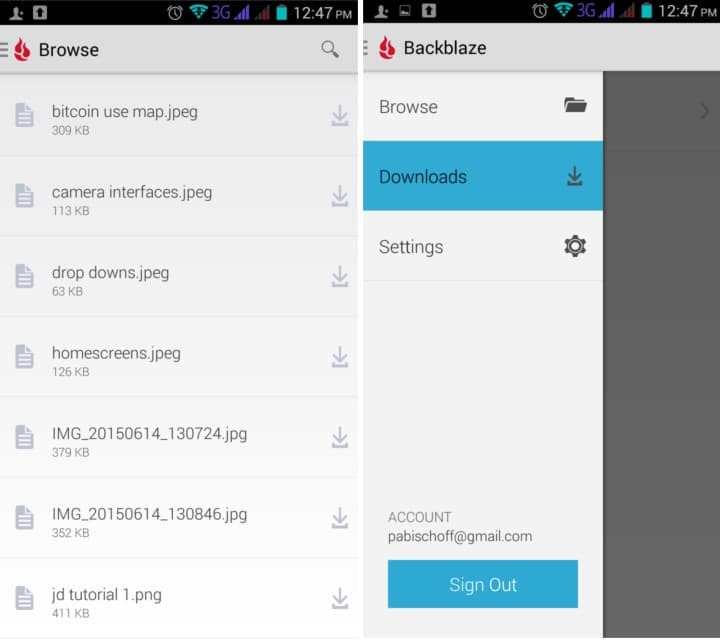 For larger recoveries, users can download and use the Backblaze downloader app to bypass downloading in the browser, which means you don’t have to worry about connection interruptions. If you want to download a file from the backup on a computer that doesn’t have Backblaze installed, you can download directly from the Backblaze web app. Backblaze’s mobile app is the biggest disappointment of the entire service. Unless you really need access to your computer’s backup on your smartphone, it’s fairly useless. It’s nothing more than a file directory, and not even a good one at that. There’s no indication as to which folder you’re in, and there’s no back or up-a-level button. Icons are not different based on file type, and photos don’t have thumbnail previews. Finally, there’s no option to back up anything on your mobile device – not photos, not contacts, not SMS. It’s just a way to access your PC or Mac backup and nothing more. Backblaze’s app is available on iOS and Android. Backblaze has a fairly thorough and well-organized knowledge base on its website. Customer support can be contacted by either submitting a request or live chat. No hours are listed, and the live chat isn’t always available. Try to hop on during US business hours and hope you get lucky. Once you do get in contact, the support staff seems fairly knowledgeable and not like they’re copy-pasting from a pre-set script. They were able to quickly answer my questions about how Backblaze’s private key encryption works. Cancellation is simple with a link to do so in the browser app (not in trial version). Uninstalling leaves behind no residual files, but doing so does not cancel billing.